Back in mid-November I'd first caught wind of bufferbloat from Jim Gettys' blog. I didn't understand the effects on TCP of bufferbloat until I saw his traces and then his more detailed analysis with different tools. "Have you seen this trace? 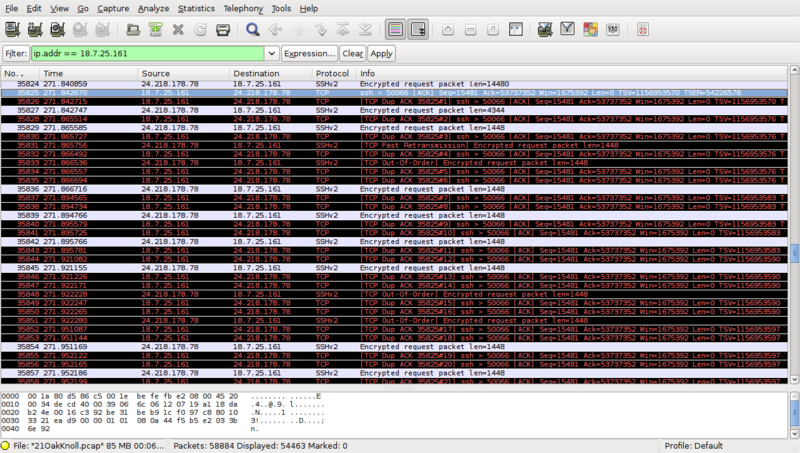 Login to bufferbloat.net to learn how to fix it..."
So, I re-ran his experiments, against the wisp6 router testbed. The results, under bad conditions (heavy rain), were horrifying.... 10s of seconds of delay in the routers (!@#@!#!)... 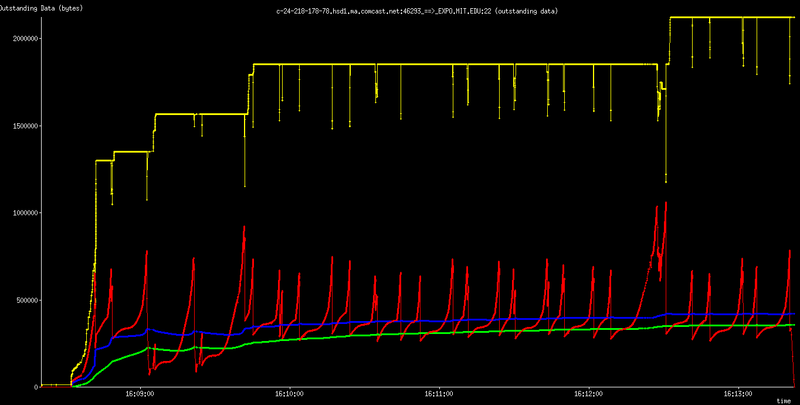 and explained why NTP, DNS, ND, DHCP, and most other traffic had stopped working under those conditions. The diagonal lines are showing latencies - across paths that should be taking under 100ms to do anything - all over the world - measured in SECONDS. I realized, finally, it wasn't just me and my devices and my little network in Nicaragua. Bufferbloat was a global internet-wide problem, one probably growing worse, rapidly. ...and so I found myself instead hacking ruby and redmine, getting multiple servers running, using my rock and roll promotion skills to get people all over the world in disparate disciplines involved, hacking kernels, fiddling with AQMs and new algorithms, reading 70+ theoretical papers, writing multiple pieces and wiki pages, making deals, swapping services, picking up dropped balls, making a ton of phone calls and exhausting my personal email address book to get bufferbloat.net to be a real, functioning entity, with developers, theorists and users from all over the world, and not a talk shop. And the rest, is history in the making. I still haven't got around to writing the piece about traffic shaping. 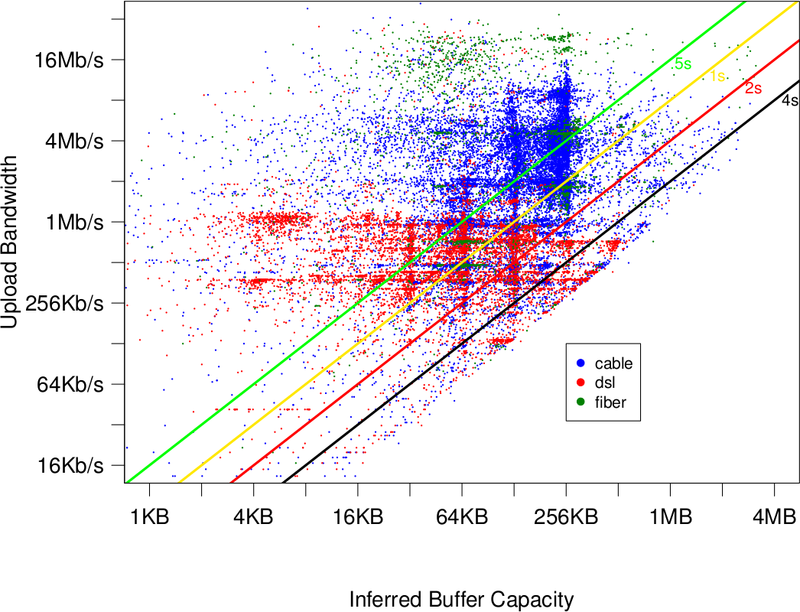 The Bufferbloat problem is almost as bad as Y2k... And more solvable. It's just that the Internet is so much bigger now than in 1999 that is intimidating. More cell phones are being added to the Internet every quarter than we had total users in 1999. There's also a persistent fear that it will get much worse, before it gets better. So we've been lining up people to fix it ever since. While doing all that, along the way, I came up with a good idea for a cosmic background bufferbloat detector that was extensively discussed on usenet, and the bufferbloat mailing list. Nobody found any holes in the concept which means (darn it) I'm going to have to code it up - or convince someone else to do so. About the only flaw in all this activity of mine is that I've been so buried by it all as to stop blogging!! The effort required to write something for a more general audience is so much greater than carrying out conversations with the people I'm collaborating with presently on email and irc that I've stopped journaling entirely. I'm trying to fix that today, a little. I wish now, that I'd opened up my writing to a writers cabal 25 years ago, or earlier. I might have got a few books done by now. Tomorrow (wednesday) I'm in open-to-all VOIP conference call about bufferbloat, with the freeswitch folk. Please join the call to hear more. Or check out bufferbloat.net. After I gave up on SIP based VOIP (after working on it for 6 years), and gave my last presentation on it, in 2006, at Astricon, I'd had no idea then that a goodly portion of the problems I'd had with SIP were tied to bufferbloat. No idea what-so-ever. Solutions seem feasible, across the Internet, for a whole new level of interactive applications after we get bufferbloat fixed. SIP phones now do IPv6, which solves a lot of problems, too. I'm seriously encouraged. Sometimes it takes giving up on something, utterly, in order to make progress. It's been a zen 2011 that way. And also resolving to actually resolve your new years resolutions - works too. All this said, I'm going to take a break from all this soon and write a bit about listening to, and making great music, and about an old, cherished concept of mine (and jeff stram's) called the jam-o-phone.